Kendal, UK -- WRITINGS by Kendal's Buddhist group are to be shared around the world in a new digital library dedicated to the faith. Jacquetta Gomes, secretary of the Buddhist Group of Kendal (Theravada), said that members were delighted that some of their works are featured in the Buddhist eLibrary and also the Chinese Buddhist Encyclopedia. 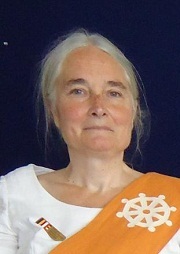 Mrs Gomes said that local Buddhists were grateful for the opportunity to leave 'to posterity' the work they had developed in Kendal and with the Ketumati Buddhist Vihara, a temple and monastery in Greater Manchester. She also thanked everybody who had supported the Kendal group over the years. Meanwhile, the online Chinese Buddhist Encyclopedia sets out to gather, preserve, translate, publish and spread the message of Buddha through historic and contemporary texts, articles, books, videos and photos. It brings together Chinese and English-speaking Buddhists, academics, students and organisations such as universities, temples and monasteries. It is described as "a vast project that will take decades to reach its final potential".